If you like elephants, you’ll be happy to know that the Thai government has officially pledged to end the ivory trade within its borders. This is great news (provided this legislative process gets carried out and leads to effective laws), because Thailand has been for quite some time one of the largest world markets for ivory, including African ivory, for which, because their tusks are larger, many more African elephants are slaughtered (and their babies culled and sold) than Asian elephants. Under current laws, limited ivory trading is not illegal, but it is, at least in spirit, heavily regulated to small quantities at a time. There is no regulation, however, on the trade of ivory for religious or traditional purposes, meaning that in practice, you can ship however many tons of ivory you want so long as you slap a label on it that says, for instance, “For Monastery.” This is known as the “Thai Loophole,” and it aids and abets the poaching of elephants all over central and southern Asia and sub-Saharan Africa. But while this latest decree may be cause for cautious optimism, it hardly spells the end of the trials facing the world’s biggest pachyderm. Elephants in Thailand are still tortured and sold on the open market every day. And nowadays, it’s primarily done for the edification of Western tourists. Babies are brought in from Burma/Myanmar and other points north, and sold to private collectors and zoos all over the world, and to tourist camps all over Southeast Asia. “People,” or some approximation thereof, have been in the area of the world that is now called Thailand for roughly 40,000 years. When in the course of hominid events homo sapiens first teamed up with the Elephantidae family (as opposed to strictly hunting them, as our various homo relatives did) is unknown, but guesses range from 10,000 to as far back as 30,000 years, i.e., ever since humans figured out how to develop tools (stone, back then) that would allow them to employ such massive animals for transportation, construction and agricultural uses. Which is what elephants were always used for, and have always been, to the present day. There’s a saying in Thai (or so I’m told, as I don’t speak it) that “Thailand was built on the back of the elephant,” and indeed Thai culture and the elephant seem inextricably linked. 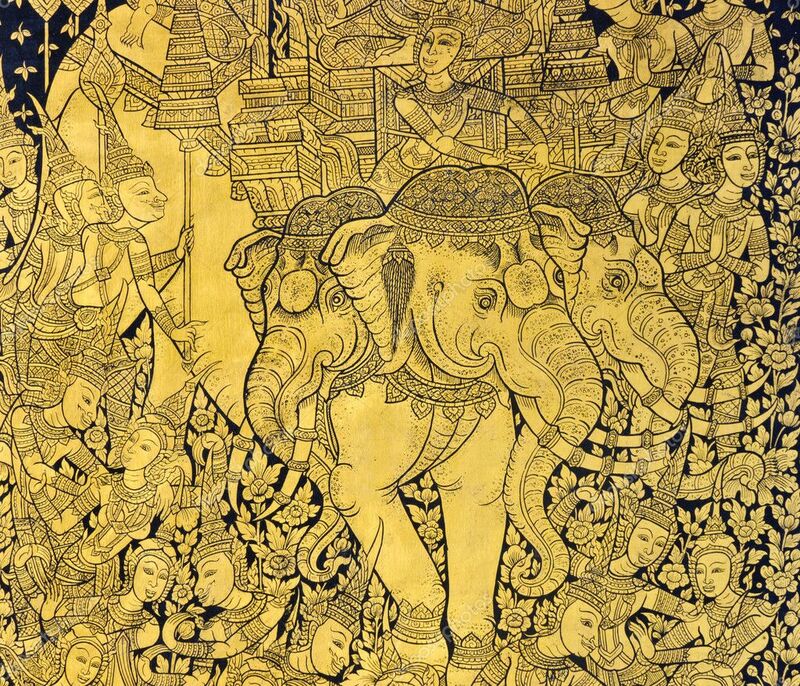 Thai in general are extremely proud of their history and they believe that the elephant was instrumental in creating and sustaining that history, and they pay the image of the elephant due homage in their historical and spiritual myths. The actual elephant, however, has always been treated less like a god and more like a big ole ox. In fact, under the law, they might as well be. They’re officially categorized as livestock, meaning the same regulations apply to them as to cattle and pigs and chickens. And oxen. But they’re not run-of-the-mill livestock. They’re incredibly intelligent and emotionally advanced, and probably because of this, they suffer greatly the vagaries of captivity. In fact, their emotional intelligence and receptivity are probably the primarily reasons people like them so much and feel, after even the briefest interaction with them, a close bond. And what “captivity” entails these days can be misleading. By 1986, Asian elephants were on the IUCN’s red or “endangered” list, meaning 5% or less of their “original” population (since when people started counting them) is left. After the Thai logging industry was dissolved and outlawed in 1989, what was left of them – which still amounted to tens of thousands of elephants – were suddenly out of work. Over the previous century, their natural habitat had been destroyed by about 90%, so it wasn’t as if they could just be turned out to pasture. Many owners, unsure what to do with their elephants and unable to support their voracious appetites, either killed their elephants or let them become strays. At the same time, Western tourism to Thailand was really starting to pick up (which was likely one of the reasons the country both felt pressure and could afford to “do the right thing” and outlaw logging). Thai elephant owners saw an opportunity to give Westerners that up-close-and-personal experience that so many of them were willing to pay quite handsomely for, so they built camps, taught their intelligent and quick-study elephants some tricks, and elephant tourism was born. Nowadays, the vast majority of elephants in Thailand live and work in tourist camps all over the country. In response to the demands of an increasingly conscientious market, many of these camps have done away with the hoops of fire and soccer balls. Instead, they now claim to be “sanctuaries” or “eco-tourism” spots that offer “natural elephant experiences.” These places run the gamut from horrible-horrible conditions to pretty darn nice ones, and while elephants are probably better off here than they ever were wandering the streets, the fundamental conditions that comprise their captivity are extraordinarily unnatural. Naturally, elephants are nomadic, preferring thousands of square miles in which to roam around. In captivity – even the nicest captivity – they’re kept in corrals and stalls and enclosures ranging from a few feet to a few acres. Naturally, elephants will meet their complex dietary and nutritional needs by eating and even self-mediating from a variety of more than 100 different plants. In captivity, they usually get grain and, if they’re lucky, a few hundred pounds of fruit a week. The Crush is an elephant-taming tradition that goes back thousands, maybe even tens of thousands of years, and it’s something that pretty much everyone involved in any capacity in training elephants believes in. 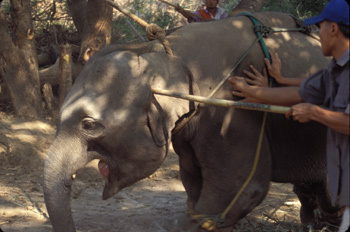 It’s like saddle-breaking a horse in the US – it’s just what you do with captive elephants. To your typical Western tourist, though, it seems a lot gnarlier. Basically, a baby elephant is taken from its mother, crammed into a tight shoot that inhibits movement, and tortured until the very last remnants of its “wild” animal spirit are sufficiently bled out of it. And when I say “tortured,” I mean prodded, cut, burned, beaten. I mean red-hot pokers inserted into the flesh, into the soles of the foot, into the ears and nostrils and mouth. I mean beating and starvation and dehydration that lasts for days on end, that takes a baby elephant to the brink of death. Phajaan – The Crush – in all its glory. phaajan.webs.com video and links to more. It ain’t pretty, and every single elephant in captivity has gone through it. Even those at the lushest, nicest, most beautiful and clean and relaxing and pleasing-to-look-and-be-at elephant eco-sanctuaries. It’s a practice that’s complicated by culture. It offends our (or at least my) sensitive modern Western sensibilities, but it’s considered a necessary and not by any means evil practice in Thailand. How else, the logic goes, are you going to get an animal that will grow to 5,000 pounds to respect you? My girlfriend and I were such tourists just a couple months ago. We spent the week around New Years at the GVI (Global Vision International) Thailand Elephant project in Huay Pakoot, which is between four and ten hours (depending on Thai traffic and the reliability of your particular Thai vehicle) north of Chiang Mai. It was great, you should go, the people are wonderful, it’s gorgeous. What makes GVI a little different than the vast majority of elephant tourism spots is that their mission is to get elephants out of tourist camps and back into a semi-natural life. This might sound easy enough, but in practice it is hard to do. Elephants in tourist camps make their owners money. Huay Pakoot, where we were put up by a family in their spare room, is comprised of about 80 families, mostly all of whom are members of the Karen tribe, one of the six Hill Tribe peoples flung out across northern Thailand and Burma/Myanmar. 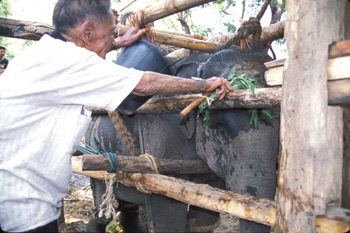 Between those 80 families, the villagers of Huay Pakoot own 60 elephants. Up until three years ago, when GVI started the program there, all of those elephants were working in tourist camps, making their owners pretty decent money – for some of them, that’s the only income they have, and all the income they really have the opportunity to make. The challenge facing GVI is to make it economically feasible for people to bring their elephants back and not lose much if any money. GVI does this by charging people for the pleasure of staying in the village and participating in the daily routine maintenance of the elephant rehabilitation program. And what a pleasure it is. Really and truly. Maintenance includes health checks and behavior observation. Basically, you hike out to wherever the elephants are, watch them for a couple hours and head back. Health checks are the only opportunity you get to get close to them – you check in their ears, look into their (big brown beautiful) eyes, look at their feet and toenails, poke at their poop (with a stick, mind) – and otherwise they’re just trying to live a relatively carefree life. They have several hundred acres to roam around in, and they have access to as many different kinds of forage food they need. It’s an experiment in alternate, responsible elephant tourism, a totally different kind of sustainability. They’ve managed to bring five elephants back so far, and have started a community-run version/branch that has brought two others back, as well. And it’s great. And I hope it catches on. But according to the GVI staff members, there are only six – SIX! – places in all of Thailand that are doing this kind of responsible alternative elephant tourism. And only one – ONE! – woman who is actually attempting to raise baby elephants from birth in semi-captivity using positive reinforcement. This woman, Sangduen Chailert, called Lek, is the only Thai voice speaking out above a whisper against phajaan and calling for a new paradigm in the treatment and training of elephants. As a woman in a male-dominated industry in a rather conservative culture, she faces a ton of criticism for calling into question a tradition that is centuries, perhaps millenia, old. The only reason this criticism isn’t sharper or more dangerous than it is is because a huge number of her would-be criticizers simply dismiss her – and the idea that these massive animals can be trusted is they’re not broken – out of hand. Mario (the Italo-Thai baby) and his mom, slacking their thirst. Elephants grow even slower than humans, their gestation is 22 months (!) and they don’t reach physical maturity until their early twenties. Everything is big about them, including their mood swings, and males especially can be extremely volatile in their periods of musth, even after having gone through phajaan. So the jury on how an elephant reacts to positive reinforcement training will be out for at least a couple decades, even on the small handful of elephants Lek is currently training that way, let alone on a large enough sample of elephants to convince old school, traditional mahouts that it’s an acceptable way to keep an elephant docile enough to interact with humans. Of course, the obvious answer is inherent in that last sentence – keep humans and elephants separated. Maybe we’ve outgrown our partnership. Or at least the kind of hierarchical partnership we used to have. But that’s not really realistic. People want their pics with elephants, and want to ride elephants, and want to bathe them and feed them and pet them. I get it. And not everyone has the time to spend a week or two or four in some remote sanctuary, or the interest or the money to do so. I totally get that, too. But if you’re thinking about going to Thailand, and thinking about seeing some elephants there, think about doing it in a responsible way. While it may be too late to save any of the elephants you’re likely to see from having gone through phajaan, every dollar or baht you spend at a tourist camp keeps that practice going in the future, and every dollar or baht you spend at a real, legitimate sanctuary helps move the industry – butterfly wingflap by butterfly wingflap – towards responsible sustainability. Babies frolicking in the wild. Plus, it helps spread the word. I had no idea this action went on until I started looking into last summer before we went to Thailand, and not a clue about its gnarly extent until we were there learning about all this action, passing tourist camps on the beach and then living amongst people who were trying to change things. And you can get the word out even if you never go to Thailand. Read up and share what you learn. If you have any questions or comments, write ’em down here or email me.